The team we all presumed would probably win the Champions League are out. No second consecutive treble for Luis Enrique and Barcelona. Any of the four semi-finalists, Manchester City, Bayern Munich and Real and Atletico Madrid, will fancy their chances now. What's next for fans of Europe's top competition? The draw on Friday at 10:30 BST. Will there be a Madrid derby? Will Pep Guardiola come up against his future club? Come back to this website on Friday to find out. Bayern Munich secure a fifth consecutive Champions League semi-final appearance after recovering from an early set-back against Benfica. Holders Barcelona suffer a shock Champions League exit as Antoine Griezmann's double sends Atletico Madrid into the semi-finals. Thomas Müller has now scored 36 Champions League goals, at least 10 more than any other German player. Muller has eight goals this season in the Champions League, his joint-best Champions League goal tally in a season. Arturo Vidal scored in back-to-back CL games for the first time since November 2013. Benfica have scored four headed goals in the Champions League goals, only Bayern themselves have more (six). Bayern have now reached the Champions League semi-final stage in six of the last seven seasons. With Barcelona's elimination tonight, no team has still ever retained the Champions League since its inception in 1992-93. It was Griezmann’s third Champions League brace this season, after scoring two in both matches against Galatasaray. 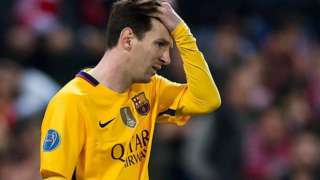 This loss ended a run of seven consecutive wins over Atleti for Barcelona in all competitions. Barcelona failed to score in a Champions League game for the first time since April 2014, which was also against Atletico Madrid. Diego Simeone has won 12 of his 16 Champions League games at the Calderon as Atletico manager (D3 L1). Want some match stats as we begin to wrap up for the night? It's rhetorical because it's happening. Bayern Munich captain Philipp Lahm: "We know that we can turn games around. We showed that once again tonight. "I think that over the 90 minutes, we were never really in danger of being eliminated." Bayern beat Benfica 3-2 on aggregate but had the edge on away goals had the Lisbon side scored again. Peter Collins: When was the last time all the ties finished 3-2 on aggregate? Same scoreline across all games! Great spot by PC here. All four ties had the same aggregate scoreline. Only former Ajax, Juventus and Manchester United keeper Edwin van der Sar (51%) has a higher percentage of clean sheets in Champions League games than Atletico Madrid centre-back Diego Godin (of players to have played 35 games or more). Ah look, 1510, I'm sure we've all been lulled into saying that a couple of times in the past and they've proved us wrong. Benfica's Champions League run may be over but I can't imagine Kostas Mitroglu is in a rush to return to his parent club Fulham. I had as many touches of the ball in Atletico Madrid's box tonight as Lionel Messi did. By his very high standards, this is one of the worst runs of his career. Barcelona manager Luis Enrique: "We have not had our best day, but in the second half we have had chances. It was not to be." Mhmd: A quick question, if Man City finish fourth and win Champions League and Liverpool win Europa League will we get five English teams?